Electrolysis or Laser Hair Removal-What's the difference? One of the most commonly asked questions that we receive is “What are the differences between laser hair removal and electrolysis?” Even though both hair removal methods can be extremely safe and effective on unwanted hair growth, choosing the most effective method is dependent on each individual’s situation. Take a look at the chart below to see what our years of experience have shown us. Visit our Laser Hair Removal and Electrolysis pages for a complete explanation on how each method works. Still have questions? Feel free to leave your question and we will answer you as quickly as possible! This entry was posted in Electrology, Electrolysis Hair Removal, Hair Removal, Laser, Laser Hair Removal, unwanted hair by admin. Bookmark the permalink. 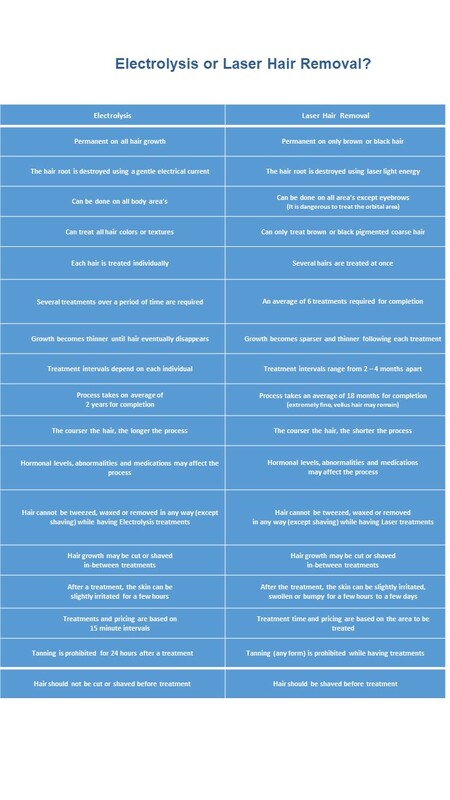 I have read many posts on laser vs electrolysis hair removal and found this one very helpful. Very well described and compared. Thanks for sharing it.